Get 25% Off on custom T Shirts today! Offer ends May 1st. Comfortable high quality T Shirts from your photos and artwork. High Quality Fabrics in 11 Colors. David L. in IL said... I love my shirts! Thanks so much for getting them here in time and I will sing your praises to everyone I know. Sarah M. in SC said... PosterBurner did a great job letting me create my own shirt. I like the style and the image came out perfect. Chris in MN said... I have used PosterBurner in the past for posters and canvas, so its not surprise to me that the custom logo on my shirt looks amazing. Keep up the good work. Ally R. in Fort Worth said... I wasn't sure how my image would look on a tshirt so I asked customer service and they got back to me right away. Five stars. Jeff in Ohio said... My shirts got here and everyone loved them. We used them for my best friend's bachelorette party and they were a big hit. We review your layout before printing. Our specialist will load your image into Photoshop to ensure the print will look great before printing. We use Ricoh dye sub printers. Our Ricoh dye sublimation printers ensure an amazing print that transfers without quality loss. We select the best shirts to print on Our shirts are high quality cotton/poly blends. Our shirts withstand the washing machine. With dye sublimation the ink is bound to the fabric and resists fading after washing. 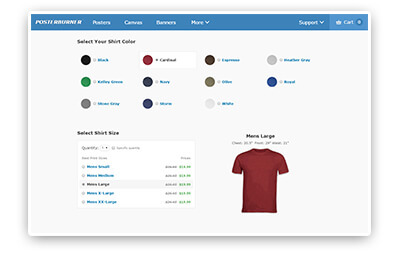 Create your custom tee in less than 5 minutes. 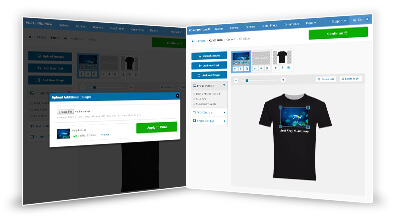 Step 1: Upload Your Image Add a single image, or multiple images to make a collage in our t shirt maker. All files are accepted. Including .jpg, .png, .pdf, .psd, .doc, .tiff, .ai, and more. Step 2: Select Your Shirt Size and Color Select from mens, womens, or child size shirts - we even have toddler size shirts. All available in a range of colors and sizes. Step 3: Customize Your Shirt Design Turn your custom made shirt into a collage by uploading additional images. You can also personalize your shirt with text. Customized shirts typically take 2-3 business days to ship. Delivery time will depend on the shipping service you select. We use an advanced process to eliminate quality loss during transfer to the tee shirt and we accept most file types, including JPEG GIF PNG TIFF PSD AI DOC PPT ZIP XLS and many more! How long until my custom shirt arrives? 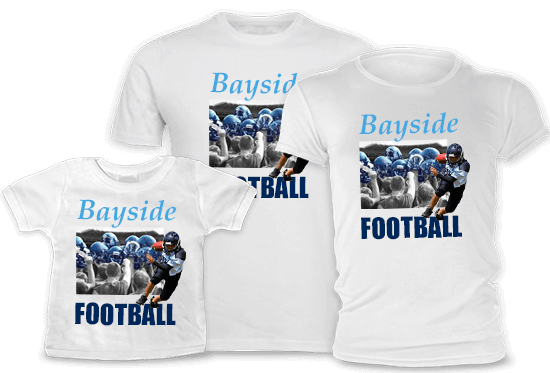 Custom shirts are usually printed and shipped within 2-3 business days. We use retail quality fabrics and premium ink that provides exceptional image quality and durability when we turn your pictures to custom prints.